Was designed by Emili Pou. Although building work terminated in 1868 the optical apparatus was not installed until 1870. It had been purchased from the Chance Brothers in England and was the only lighthouse in the Islands, together with that at Punta Grossa to have a lamp of this type to be included in the 1847 plan. It was opened on August 15, 1870. The original project from August 1861 provided for a 2nd order lighthouse with a large circular building (25m diameter) and a tower situated at the internal curve of the circumference facing the sea rather than at the centre. It was to have 15 rooms and was finally rejected by Madrid, considering that so many rooms and so much luxury was excessive for a lighthouse. 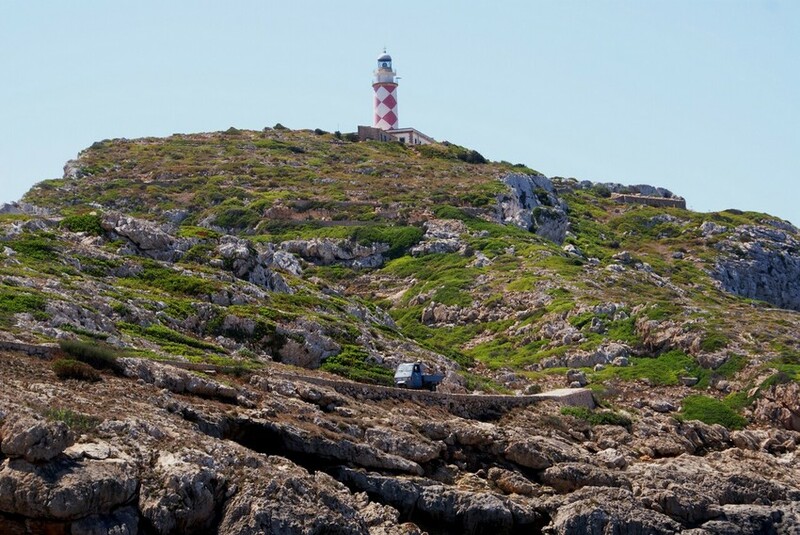 In 1936 the lighthouse keepers were transferred to Menorca in a Republican submarine. The lighthouse was abandoned for two years. In 1929 a new lens in a mercury flotation bath was installed emitting a signal of three white flashes every 10 seconds. This optic was mounted with six of the twelve original panels of the original lens that emitted a white flash every thirty seconds. As part of the 1967 Improvement Plan, the height of the tower was raised and it was generally refurbished, its lantern being replaced by a more modern construction and it was painted in its characteristic red and white diamond pattern. It is disturbing to think that the lighthouse was built only 45 years after twelve thousand French soldiers had died in overcrowded conditions, with some cases of cannibalism being recorded. The lighthouse was automated in 1971 using acetylene-powered Dalen equipment and ever since then has been unmanned.